A screen grab taken from news footage by Japanese Government broadcaster NHK shows cars on a flooded street following the earthquake-triggered tsumani in Miyagi prefecture, March 11, 2011. Japan is one of the most well-prepared countries in the world to deal with the threat of a tsunami. Warning systems are in place, and concrete sea walls wrap around much of the coastline. But nature's wrath on Friday was just too big for the man-made protective measures, raising the question, what went wrong? VOA's Kate Woodsome reached out to Costas Synolakis, a tsunami expert with the Department of Civil and Environmental Engineering at the University of Southern California, to find out. What went wrong with Japan’s tsunami warning system? "Japan is one of those most well-prepared countries on earth in terms of tsunami warning. They had a warning. Clearly what went wrong is they had not anticipated the size of this event. There are two reasons for it. One is that they haven't had any event in even recent memory, the last 100, 150 years, that was anywhere as big as this one. And two, seismologists and geophysicists hadn't anticipated such a large earthquake happening off Japan. So, on both counts, part of the warning system is essentially to have inundation and flooding maps, and make plans for people. I think that it is that part of the system that failed." Forty percent of Japan’s coastline is lined with concrete seawalls. What role did they play in this disaster? "The concrete seawalls in many places in Japan are about 10 meters, that's about 33 feet. In Sendai, they were about three meters, that's about 10 feet. So that shows you that at least in that area they were not expecting such a sizeable wave because they would have built a higher seawall. In some ways, the low seawall complicated things, because sure, it's better than nothing, but on the other hand, waves were caught in and quite possibly people were caught in a false sense of security, and emergency managers thought they had sufficient defense, which didn't prove to be the case." Should these seawalls be redesigned, be built taller, or is it flawed thinking to say man can hold nature at bay? "Well, it's both. I think the new thinking that we're developing worldwide is that we have to build community resilience. This sounds holistic, but in fact it's much more than that. A resilient community to coastal hazards needs to have resilience which means essential redundancies in anything, energy, transportation, water, emergency management, housing, everything. If you overestimate or overinvest in one part of the system, like building coastal defenses, and then you do not invest in the other parts of the system, like backup systems or redundant systems, then, you get what we just saw." How fast does a tsunami travel, and how fast, and how far and how high would you have to run to get away from it? "The answer depends on what part of the coast you're at. If you're on a coastline that's fairly flat, you have to go fairly far inland, at least three miles, four miles [about five or six kilometers], and if you have about half-an-hour to run, three miles in a half an hour, that's a good jog. Most people wouldn't be able to do that. I think in Japan they have plans for vertical evacuation structures, so people would evacuate to buildings nearby and in some cases they're building special evacuation structures, but most of their defenses and evacuation structures were designed too low, because they were not expecting this size of a wave." 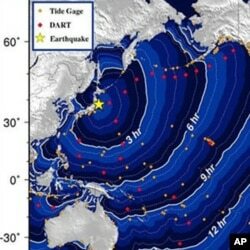 The National Oceanic and Atmospheric Administration issued a tsunami alert 12 minutes after Japan’s earthquake using a system of sensor buoys. "Right. NOAA detects an earthquake with seismographs on Honolulu and in Boulder, Colorado. They make an initial assessment. Then, they have pre-computed scenarios for practically all the earthquakes that can possibly take place around the Pacific Rim, and now they're doing this for the Caribbean and the Indian Ocean. They look at the closest scenario, then they wait up until the tsunami reaches any one of these NOAA buoys. These instruments essentially sit on the seafloor. They are bottom pressure recorders. They record the changes in the water pressure as the tsunami goes by, and then they emit a signal that goes into the buoy, and then from the buoy it goes to a NOAA satellite, and from the satellite, it goes into the warning center. NOAA map shows estimated tsunami travel times after Japan's earthquake. As the tsunami advances across the Pacific, they get new measurements and they update the forecast. And in this case, just like what happened in Chile last year, there was an 8.8 earthquake on February 22, the forecast was right on for practically all the places that we know of around the Pacific. There were no surprises there. The forecast, it worked." The tsunami in Japan pushed houses and cars inland. What happens when the water goes out? Are we going to have cars all over the ocean? "Generally no, because what happens is a single tsunami is not a single wave, it's a series of waves. So typically what happens is they will move back and forth but generally as they move inland, they will be stuck, and then the next wave is not so big, so it's not going to be able to draw them back. It turns out it's not that difficult to get a car to move. All you need is about less than three feet of water and the car will float. Once it starts floating, typically it will get tangled into debris that's already there, and it will get stuck, it will get overturned a zillion times. Sometimes you have hard time recognizing the brand of the car since you see a skeleton after the tsunami. Mercifully they don't get dragged out to sea so they don't pose any further hazards. They don't do any contamination." How can the world better prepare for tsunamis? "Well, I am fairly disappointed that almost six years after we've had the Indonesian tsunami, we're still lacking in certain areas. One is public education. Then, around the world as we go around the Pacific, we see failures of the system. For example, in Samoa, people evacuated by car. There were traffic jams and people drowned. The hills were very close. In some cases they were 300 feet [91 meters] away. They could have easily climbed up the hill, 30 feet [nine meters], and would have been safe, versus waiting in a traffic jam to move away from the beach. What we saw in Sumatra and Indonesia last October, when there was another tsunami, is that the government relied on these lines that go underneath the TV screens and interrupt the broadcast saying, 'There's a tsunami warning, evacuate.' Well hello, most of the villages at risk, the islands don't have any electricity. They could have had sirens, and they could have been powered by solar generators, solar panels, and they could have communicated with signals like what we have in mobile telephones. But they didn't. They relied exclusively on broadcasting something on TV when most people there don't even have electricity. So it's gaffes like this that just shouldn't happen in this day and age. After we've seen essentially hundreds of thousands of people having died in tsunamis in the last six years, we shouldn't be doing these things. We should be doing much better than this."